HARVEY A. PINCOMBE, age 85. Beloved husband of Eileen Pincombe (nee Russell). Devoted father of Cathy Darnell (Michael), Beth Kisil (Robert) and Laurie Valentine (R.J.); loving grandfather of Kevin, Matthew, Steven, Katy, Ryan (Kristy) and Jessica (Chris); great-grandfather of Reise, Grady, Logan and Cali; dearest son of the late Howard and Marceline Pincombe (nee Brazie); dear brother of Barbara Soza-Anderson (Karl, deceased), Marcia Levigne (Dominic, deceased) and Cheryl Pincombe; cherished uncle and friend of many. 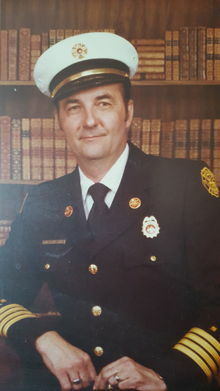 Harvey worked for the Middleburg Heights Fire Department for 30 years and retired as Chief in 1983. He was a Member of the Brookside Masonic Lodge for 40 years. Proud Army Veteran of the Korean Conflict. Passed away on Friday, March 8, 2019. Memorials may be forwarded to Kindred Hospice/Grace Hospice Foundation (Attn. Teresa Wimms) 4401 Rockside Rd., Independence, OH., 44131. Friends may call at the BUSCH FUNERAL HOME, 7501 RIDGE ROAD, PARMA FROM 1:00 PM UNTIL THE TIME OF FAMILY SHARING AT 3:00 PM, SATURDAY, MARCH 16, 2019. Cremation by Busch Crematory. Wishing You Peace to Bring You Comfort, ..Courage to face the days ahead and Loving Memories to forever hold in your hearts. Sincere condolences on the lost of your Father. Sending my deepest sympathies to all who loved and knew Howard. My mother and he were first cousins on the Brazie side and he's shared our mutual family history with me some time ago. My thoughts are with his family. Please accept my sincerest condolences. Mr. Pincombe had a wonderful sense of humor and was a very sweet man. Thinking of you Mrs. Pincombe. Sincere condolences to the Pincombe family. Harvey was a true gentleman full of wit and wisdom. I enjoyed talking with him and listening to his many stories. Rest in God's care, Harvey!